In highschool I failed miserably at chemistry and physics. I do not have a head for math at all. So, when it comes to what I feel is a science project, my heart and stomach are always in knots. When I committed to doing this baking challenge, the first thing I did was start the seed culture listed on pages 238 -244 of Peter Reinharts book The Bread Bakers Apprentice. Rewind sevens years ago the same seed culture from the original edition of the same book failed miserably as did the barm. This is not a testimony to the instruction of the book but my inability to make science projects work. Something changed this time. I would like to think it is because I have 3 characteristics as an adult I didn’t have as a 15-16 year old or as a busy mom with two kindergarten aged girls. I have drive, a genuine desire to learn and a goal. It makes all the difference. 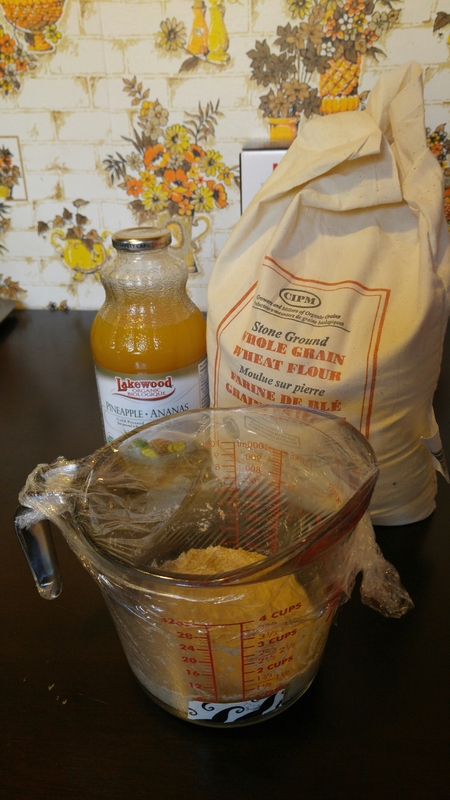 A barm can be called a starter or mother starter and is used in making sourdough breads. I understand now that perhaps the term sourdough might be a misnomer as a more correct terminology would be wild yeast bread as that is what starter is, wild yeast. The seed culture was a three day process and options were given on what ingredients to use. I chose an organic coarse milled Canadian whole wheat flour (in just the cutest little cotton bag ever) that I found in Whole Foods. I chose to use pineapple juice over water because 7 years ago water failed. I chose an organic cold pressed, unpasteurized pineapple juice I found at trusty Whole Foods. I was banking on the fact that organic and unpasteurized would give me the wiggle room to develop yeast. In Ottawa we are in the middle of winter with temperatures as low as -20. So, the second leg up I gave my science project was to leave it in the oven with the pilot light on which registers anywhere from 75 to 78 degrees. Day 1 was a success…I had growth. 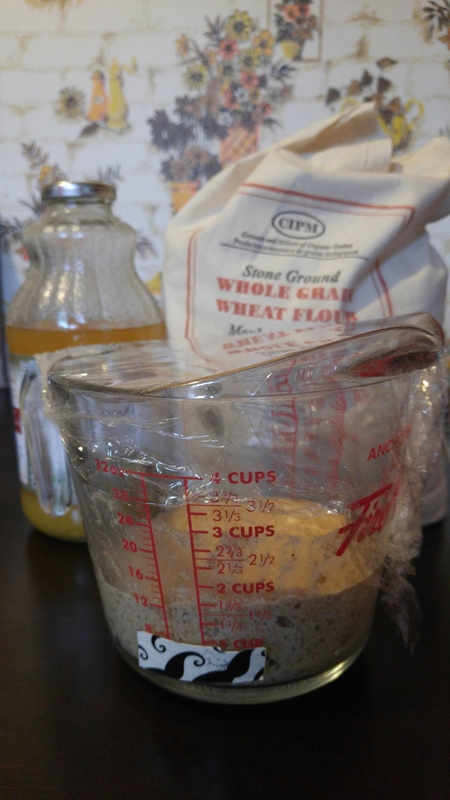 For day 2, I chose pineapple juice over water and organic Canadian bread flour for it’s feeding and then let it rest in my oven with the light on overnight. Day 2 was a success. For day 3, I used water and my bread flour. I had lots of bubbling and my culture doubled in volume so I moved on to making my Barm. To make the barm I followed the instructions given and now have a lovely, sticky, wet, bubbly, scented starter. 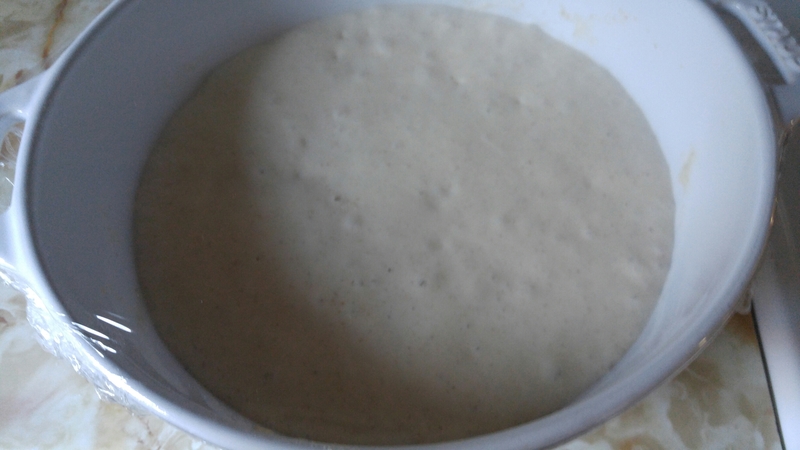 I did not think that my starter would be successful this quickly. Mr. Reinhart suggests that some starters can take up to ten days to activate. 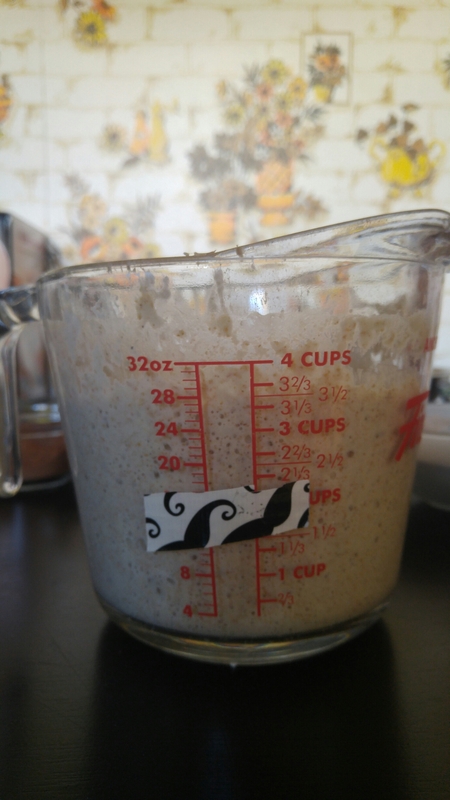 I invested time and care to develop my wild yeast so it changes my baking strategy so my efforts are not wasted. My baking and writing will be prolific this week and next. I ended up with 673 g of starter.